1. In medium bowl, toss strawberries and 4 tablespoons sugar. In separate medium bowl, whisk together eggs, milk, melted butter and vanilla extract. In small bowl, whisk together flours, baking powder, salt and remaining 2 tablespoons sugar. Whisk flour mixture into egg mixture and whisk until smooth. Cover and refrigerate 15 minutes. 2. Whisk batter. Heat 8-inch crepe pan or skillet over medium heat; lightly coat pan with oil. When pan is hot, ladle 1/4 cup batter into center of pan and quickly tilt pan to evenly coat bottom of pan with batter; batter should set immediately and form tiny bubbles. Cook 1-1/2 minutes or until bottom of crepe is lightly browned and top looks dry. Carefully lift 1 edge of crepe with rubber spatula; grab crepe with fingers and flip. Cook 1 minute or until bottom is lightly browned. Remove crepe from pan and place on plate; keep warm. Repeat with oil and remaining batter, stacking crepes off center on plate. 3. To serve, place crepes on work surface and spoon a small amount of strawberry mixture along center of crepes; fold over sides to enclose and secure with toothpicks. 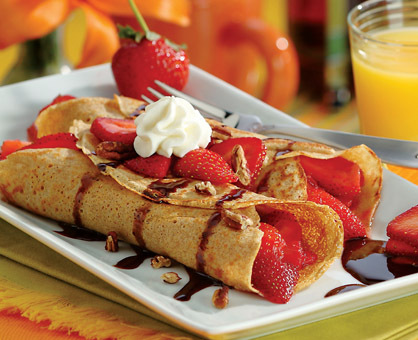 Top filled crepes with chocolate syrup, whipped cream, pecans and strawberries, if desired. Crepe batter may be prepared, and strawberries and sugar may be combined a day in advance and refrigerated. Whisk crepe batter well before cooking. Prepared crepes may be stored in large zip-top plastic bag or wrapped in plastic wrap and refrigerated for up to 3 days. Reheat crepes in microwave oven before final preparation.